My first trip abroad will be, I hope, just a starter on a long life filled with voyages. Today we got up at 5:16 breakfast at 5:45 leave at 6:15 to Rheims & the battle fields . We drove thru Meaux, Dormans the famous ? Woods , to the American cemetary where 4000 boys are buried then to Chateau Thierry  and Rheims we saw the Cathedral  & the reconstructed parts of the town. Much devastation still visible. Then onto 108 Hill where 5000 French were instantly killed, past the Hindenburg line & Back to Paris. Grave yards all along the way. Saw Richtofen’s plane in a heap in an old field . Again from the Oklahoma Historical Society, this home movie footage from 1928 covers much of the same ground as Vincent’s tour group. From 14:44, you can see the same battlefields that Vincent visited the same year. Turn down the sound down while viewing. Tour of the city today went to the chapel of St Louis & it was very beautiful. Then to Notre Dame which is historical as well as beautifully interesting. 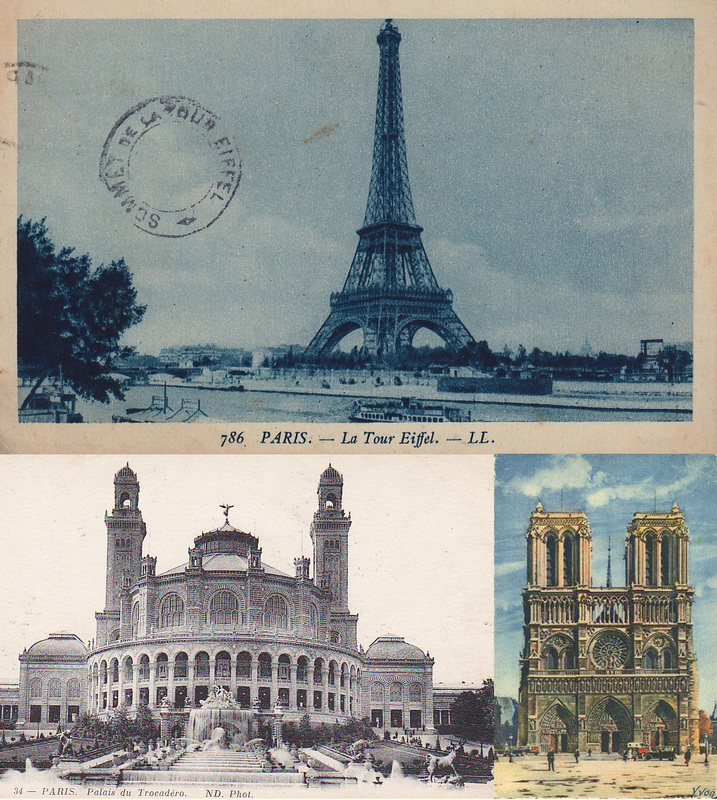 Saw Eiffel Tower & Trocadero. The Tomb of the unknown soldiers. 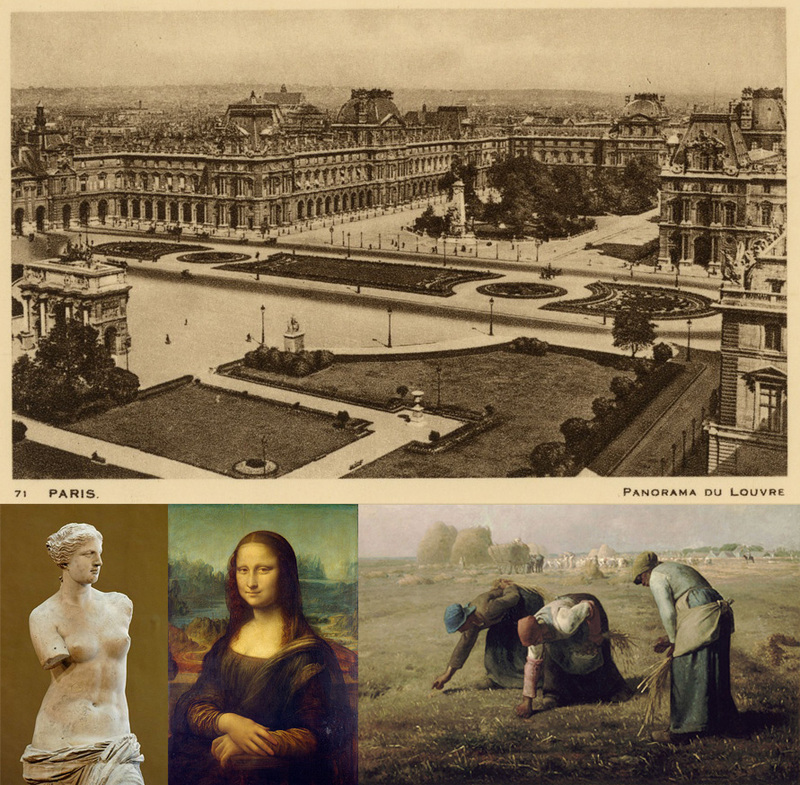 After lunch we went to the Louvre* where we saw Mona Lisa, Venus de Milo, Winged Victory & The Gleaners. There, too, were millions of paintings by every artists. Tonight we went to Moulin Rouge & I have seen such a beautifully costumed show. The scenery was just as gorgeous as the girls not at all risqué. 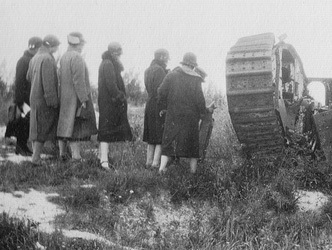 The battlefields between Reims and Verdun were much visited in the 1920s and 1930s with wrecks of tanks like these ones close to Fort La Pompelle becoming tourist attractions post-war, remaining littered in fields until they were scrapped by the Germans during their occupation in the Second World War. This 1925 photo comes from Paul Reed’s WW1 Photos Centenary Website. Read more here. The Belleau Woods Monument (read more on the American Battle Monuments Commission website). You can read more about the 1918 Battle of Chateau-Thierry here or from the Wikipedia page here. You can read about the reconstruction of Notre-Dame of Reims from the official website. * In 1962, Vincent narrated an audio tour of the Louvre for Colorslide Tours, a collection of recordings about European travel and art. You can view it here in two parts. 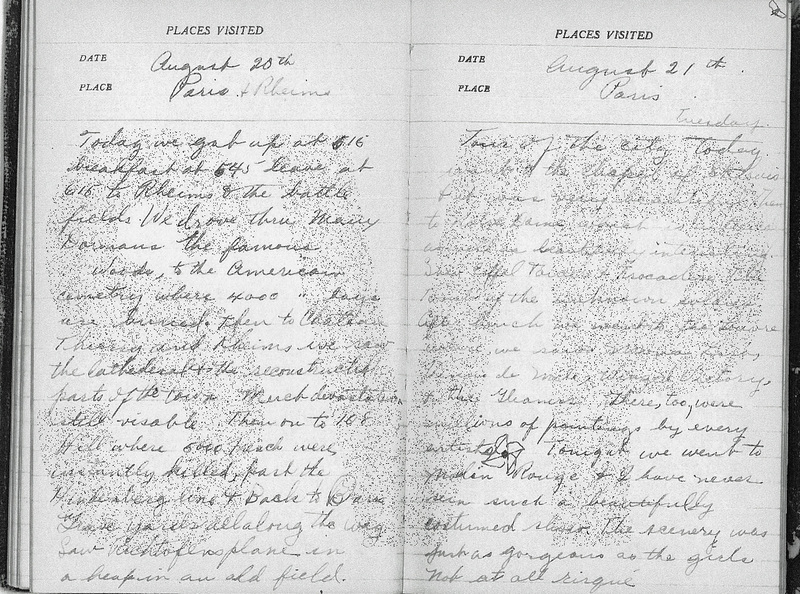 [sic] Although Vincent misspells words in his journal, we have kept them as he wrote them.